Gowns, the difference between Life and Death. Home › News › Gowns, the difference between Life and Death. Hospital infections are one of the main reasons for morbidity and mortality at hospitals, especially in developing countries. It is ironic that people who come to hospitals to recuperate sometimes unexpectedly catch a harmful disease or infection. Personal Protective Equipment (PPE) is special type of medical equipment for healthcare workers and patients. This type of medical equipment is vital when it comes to preventing and reducing the chances of being exposed to infections and getting physical injuries. According to CDC 2013 report, about 1 out of every 20 patients acquire an infection from a hospital that they didn’t have when they were first admitted. Moreover, patients who initially only planned on staying at the hospital for short period of time that wore poor quality medical clothing have the higher chance of staying longer than they expected, due to unwanted contaminations transmitted by other patients. Therefore, using poor quality medical clothing at hospitals or clinic can put the life of patients and healthcare workers in danger, especially the lives of doctors and nurses after treating patients contaminated with any kind of virus. 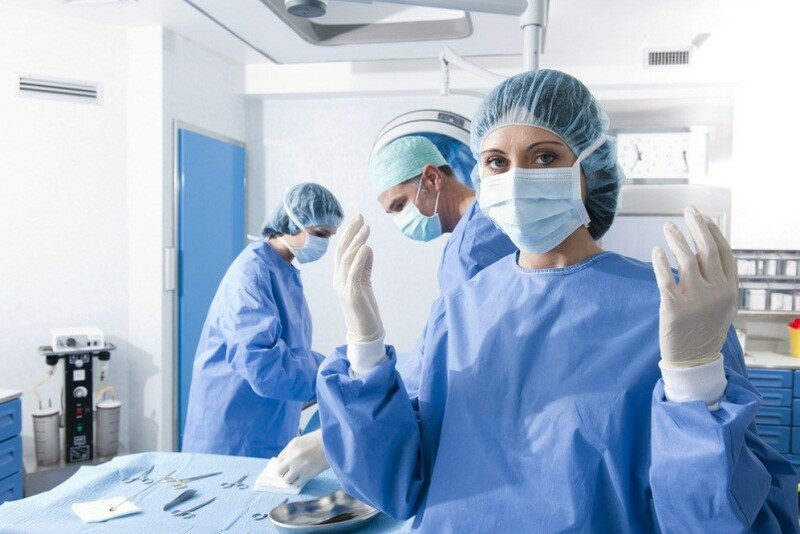 Gowns are required not only for reasons of protection, but also make it easier for doctors to examine the patient’s whole body in a shorter amount of time. For certain procedures including MRI’s, X-Ray and CT scans, it is required that both doctors and patients remove clothing for many reasons. One reason is that when the patient is wearing a gown it makes it easier for them to go from one procedure to the other, without the need to constantly remove and put back on articles of clothing. Another reason why gowns are required is that it is possible that the patient has metallic objects on his/her clothes which can be heat up during X-ray or CT scan which can potentially cause harm. Most importantly, gowns are very important to have in every hospital and clinic because they provide protection from pathogens and contamination for both the healthcare workers and the patients. There are different types of gowns available. The basic hospital gown is made out of paper, along with some types made out of cloth. Different gowns are worn based on the level of protection, which is required according to the situation and condition of the patient. In 2014, Ebola outbreak put spread fear across West Africa because the Ebola virus was having a high mortality rate; 70 percent of the infected people in Guinea, Sierra Leone and Liberia died. Due to the devastating outbreak, many governments highlighted that Personal Protective Equipment including Gowns are essential and necessary for all healthcare workers and patients who stay at hospitals and clinics. After the death of more than 500 healthcare workers in 2014 during the Ebola outbreak, people became suspicious about the quality of the gowns and PPEs being used by the healthcare workers. According to CBS news report in 2015, sub-standard gowns were supplied to those treating the Ebola patients in Liberia. Those gowns that were provided failed AAMI level 4 permeability and also the pressure tests. Bodily fluids could penetrate the gown and come into direct contact with the person wearing those gowns due to the leakage, which is known as a ‘strike-through’ in medical terms. The actions leading up to Liberian hospitals and clinics being provided poor quality medical products led to a catastrophe, killing more than 500 healthcare workers. Those that were held accountable for providing these low quality medical products faced a major lawsuit in Liberia. This clearly shows that getting the right quality medical equipment is the most important for both hospitals and manufacturers and distributors of medical products. If you are looking for a reliable source of medical clothing, StaySafe™ Medical Clothing, a brand division of AdvaCare Pharma can meet your demands. StaySafe™ Medical Clothing provides affordable hospital gowns with the finest quality in different levels of protection. StaySafe™ Medical Clothing aims to provide high-quality medical clothing not only to meet the demands of the developing world, but also to lower its price so that end users can afford to buy our products when they need. Looking for a good medical product manufacturer? Inquire with us today if you are interested in distributing our medical clothing products. 2019 StaySafe Medical Clothing. All rights reserved.